Amish have never settled in New Jersey, though with large populations in neighboring states, there are an abundance of shed dealers selling their products in the Garden State. Residents of Newark, Jersey City, Camden, Trenton, Paterson, Edison City, Elizabeth, and other cities are within close distance of the approximately one dozen Amish shed outlets found across the state. Find one near you in the guide below. A big selection of hand-built sheds, gazebos or play houses available. All of their product are made by skilled Amish craftsmen from Pennsylvania. Custom-made sheds available as well, with a broad selection of options. Amish Mike is a family-owned and operated business operating since 1978. A leading seller of Amish-crafted sheds within an hour’s drive from the Newark area. Selling Amish outdoor and storage buildings such as barns, gazebos and pool houses. This business carries a broad selection of products made by non-Amish builders among some Amish ones. Custom-built sheds available in a few different designs. This store specializes in Amish-made sheds, garages, barns, bridges and wooden play structures. Sheds are made from materials such as board and batten, vinyl, steel, cedar, or dura-temp. Fox Run Storage carries a broad selection of Amish-made sheds in various styles such as mini-barn, Cape Cod, Quaker, firewood or A-frame. Each piece is made from the best wood and vinyl materials and can be customized to any specifications. Other Amish-built storage buildings available as well. Amish-crafted sheds, available in a broad choice of styles including Quaker, Cape Cod, Dutch, mini-barn, or A-frame. A vast array of options available as well such as 12 different trim and shingles colors, additional doors & windows, storage lofts, flower boxes and more. Sheds, gazebos, arbors, play houses, pool houses and more outdoor and indoor products, handcrafted by skilled Amish woodworkers. Amish-built sheds come in a broad choice of styles including Cape Cod, Quaker or mini-barn. A-frame sheds, Cape Cod, Dutch style and more styles available. J & L Crafts products are hand-crafted by Amish woodworkers. A broad selection of shed options such as roof, siding, windows or vinyl allow you to customize your storage building. Oak Tree Sheds & Gazebos provides some Amish-built sheds and gazebos, available in a broad choice of styles. A big selection of options such as roof, windows, floor, trim or vinyl colors available as well. Amish Country Sheds features a large choice of sheds, available in common styles. They offer free local delivery of their Amish-made products. South Jersey Sheds and Gazebos provides an extensive choice of Amish-built sheds and other outdoor products. Economy sheds, Cape Cod, Classic, Quaker style sheds, Hip Barns and more available in variety of options including siding, trim or shutter colors, or shingles selection with such types as grey, cedar, bark, green, slate and more. Note to New Jersey residents: Please confirm business hours of Amish shed retailers listed above, as locations and business hours can change. Not responsible for changes to the above information. Custom ordering an Amish shed gives you control over numerous shed features, including roof style and shingles, windows, doors, flooring, and more. Who builds Amish sheds and storage buildings? While there are some larger Amish businesses comprising 30 or more employees, they are the exception to the rule. 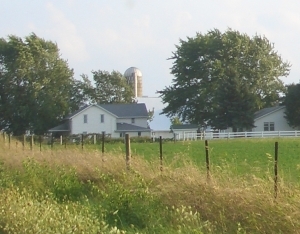 Amish companies typically operate from small shops based at Amish homes and farms. An Amish shed builder may have a few employees who live in the surrounding area, and who walk or take a short ride to work. The business owner is frequently involved in building the sheds himself, which is one aspect that helps insure a high-quality job. Amish society in general values work well done, so even with an absent owner, Amish shop workers can be relied upon to do the same level of good work. At Amish businesses you’ll often see children helping out (in situations where it is permitted) as the Amish emphasize teaching their young the value of work. Families get involved across the board, with female members (wives and sisters) often doing book or customer work, and sometimes helping out with the manual side of things too. Like other Amish companies, Amish shed construction is often truly a family affair (more on Amish furniture in NJ). Where can I find Amish storage buildings in New Jersey? The Amish shed business listings above are all retail dealers of Amish sheds, as no Amish live in New Jersey. These shed outlets, spread across the Garden State, offer NJ residents numerous convenient locations to view and order an Amish-made storage building. They offer the convenience of close proximity, and can often arrange custom work via their Amish suppliers. Alternatively, for those who would like to buy an Amish storage building or other outdoor structure direct from the source, some travel to Amish areas in neighboring states. Pennsylvania is well-known for its large Amish community centered in Lancaster County, also a hotbed of Amish business activity. New York also boasts a growing Amish presence, with a number of businesses present in the Empire State as well. Not all Amish shed builders will sell you their products (some produce exclusively on a wholesale basis), but some do. See the Amish Sheds – Pennsylvania guide for Amish shed builder locations in the Keystone State, or the Amish Sheds – New York listings for the Empire State. There is a third option for New Jersey Amish shed seekers. Buying an Amish shed online is a very feasible path to take, with a number of online outlets providing Amish storage buildings among numerous other products. Such companies often offer delivery (sometimes free within a local area) and may even set and install a shed in its new home. Looking for an outdoor storage shed that can be built on site. Do you offer such service? Hello, I am looking for 2 information kiosks to be built. Can you recommend someone who can build them or at least give me the plans and a kit to build them? .